Check out this touchscreen all-in-one pc from HP the HP TouchSmart PC IQ500 All-In-One. 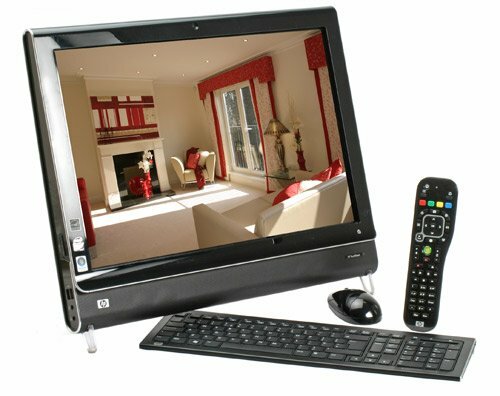 This is a second generation HP TouchSmart PC, the first being the IQ770. The IQ500 however is very different from the original. The original TouchSmart was a rather bulky pc system but the IQ500 is more compact and thanks to some funky styling and an innovative stand it is a completely different beast. A smart glossy black bezel and silver trim surround a 22in, 1,680 x 1,050 LCD display that, like the iPhone, uses capacitive rather than resistive touchscreen technology. All you really need to take from this is that whereas older touchscreens required a certain level of pressure, the screen on the IQ500 responds to the lightest of touches. It’s also an impressively bright and colourful effort, bringing out photos and video with no shortage of fidelity, even if the glossy finish renders it more reflective than many. 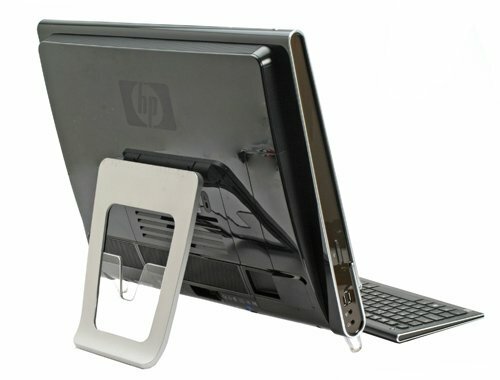 The stand system used by HP is indecently simple but also incredibly effective. At the front are two Perspex legs both of which are balanced against a large adjustable arm at the back. It can be adjusted to offer anywhere between a 10 degree and 45 degree viewing angle. Either side of the screen are an assortment of connections and shortcut buttons. On the left are a couple of USB ports, headphone and microphone jacks. A button for adjusting the ‘ambient light’ runs along the bottom edge of the machine, lighting up the keyboard in the dark.